The Waverly school speed zone in the sunshine of January. The 20 mph zone will be shortened, the city council decided Monday. Efforts by some Albany residents to modify or eliminate the school speed zone on Waverly Drive have ended in a partial success. The city council Monday agreed with a staff recommendation to reduce the length of the zone by about two-thirds. At its Monday work session, the council unanimously went along with the recommendation of Ron Irish, the city’s traffic systems analyst. 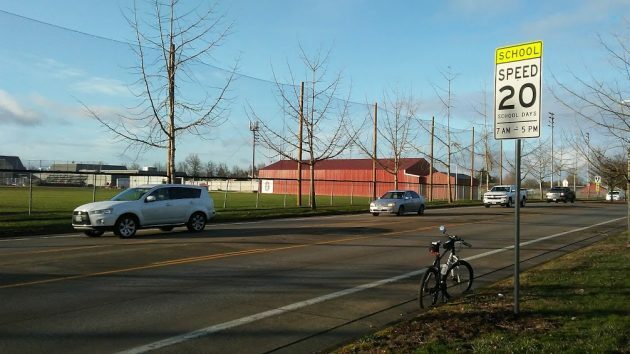 Accordingly, the length of the 20-mph school zone outside the South Albany High School athletic fields will be reduced from 1,200 feet to about 400 feet, or roughly 200 feet on either side of the pedestrian crossing at 36th Avenue, where there is a pedestrian-activated flashing beacon. The shorter zone will remain in effect from 7 to 5 on school days. The underlying speed limit on Waverly is 40 mph. Irish reached his recommendation in an engineering study you can read here. The length might be further reduced if Irish follows through on a suggestion by Councilman Rich Kellum to stagger the zones, making them shorter on the downstream sides of the crossing. Irish saw no compelling reason not to do this. The Albany Traffic Safety Commission, which advises the council, had supported Irish’s recommendation on the condition that a second pedestrian crossing, south of 36th where there’s a median island across from a locked gate in the athletic field fence, be equipped with a pedestrian-activated beacon. But as far as I could tell, the council did not add that condition. No word on the timing of the changes, which will require moving the signs. Meanwhile, the city has ordered “end of school zone” signs for all school zones that don’t have them. The lack of such signs on Waverly caused Municipal Court Judge Robert Scott this month to find South Albany resident Johnny Scot Van Ras not guilty of going 39 mph in the zone last October. Is one child’s life worth driving a few miles faster to get to your destination. Maybe leaving home earlier is a safer answer. Drive as though it is your child. If it’s a zero-probability event you want (not one child’s life), then you should seek to ban all automobile driving within a specific radius from the school. Is this reasonable? It’s funny, Jefferson, Sweet Home, Lebanon can afford lights, telling when to watch out for kids, but Albany can’t.